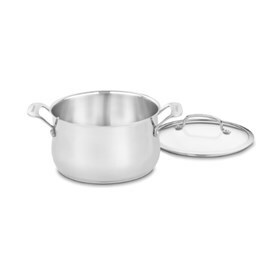 The Cuisinart 445-22 Dutch Oven is a stainless cookware which features an aluminum disc at the base to maintain even heat distribution, eliminating hot spots. It has core of pure aluminum bonded to stainless steel interior and a brushed stainless exterior for unsurpassed cooking performance. The premium stainless steel cooking surfaces do not react with food or alter natural flavors, while its lid seals in moisture and nutrients for healthier, more flavorful results. The 5 Qt. Dutch Oven With Cover Contour Stainless has many exciting features for users of all types. See the 5 Qt. Dutch Oven With Cover Contour Stainless gallery images above for more product views. The 5 Qt. Dutch Oven With Cover Contour Stainless is sold as a Brand New Unopened Item.